What are the Primary Health Concerns of Women with Disabilities? A study and related article called “Health promotion interests of women with disabilities“, by Suzanne Smeltzer and Vanessa Zimmerman identifies some of the top ranking health concerns for women with disabilities. Key concerns include: Disability and Aging, Stress Management, Exercise, Nutrition, Healthy Eating and Weight Management, Health Promotion, and maintaining mental health. [i] 62 percent of the survey participants identified Nutrition and Healthy Eating as a concern. [ii] This piece will focus on Healthy Eating, my personal experience and encounters with professionals over Healthy Eating and Weight Management, as well as highlight some statistics, and available resources which can support Healthy Eating and Weight Management for women with disabilities. I’ve thought extensively about past communications I’ve had with Doctors, Nurses, and other Health Professionals. Discussions and guidance about Nutrition, Healthy Eating, and Weight Management did not come up. I do not recall being asked about my eating habits. I do not remember receiving counseling or information about recommended nutritional guidelines, portion control, weight management, exercise, or physical activity. The one encounter I do recall on the topic of Weight Management was during an uncomfortable health visit. The clinic environment felt rushed. Staff was clearly trying to make up time for patient visits that went over the allotted time. 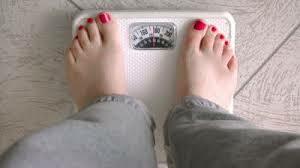 The Health professional I was dealing with was harried and impatiently prompted me to get on the weight scale. I was not successful in communicating that I could not stand still on the narrow scale stand without my walking devices. I could not maintain my balance. As a result, my weight measurement was not accurate. Another professional more helpfully suggested that I should see a Nutritionist since changing certain eating habits would support my mobility goals and overall efforts to walk without devices full-time. After my fairly bumpy encounters concerning Healthy Eating and Weight Management; I engaged experts with established knowledge in Nutrition and Healthy Eating to get my habits on track. I completed a food inventory and was also given the task to keep a food diary over a minimum of a two week period to track what foods I was eating. The diary included space to document the types of food I was eating, beverages I was drinking, the portion size and/or amount, the times of day I consumed the food, estimated calories, and other notes. An example of an online food diary and resource tool is (http://www.myfitnesspal.com). As a result of the diary, I learned to eat better. For example, I reduced my sugar consumption, increased my consumption of vegetables, and increased the amount of water I drink. Finally, according to the National Center for Health Statistics, obesity increases with age in African-American women, and increases through age 59 in Caucasian women. Through this personal account, I have attempted to highlight some key concerns of women with disabilities related to their health, the growing prevalence of obesity among women; particularly as they age, and a lack of information and other factors that impede women with disabilities from engaging in Healthy Eating, Weight Management, and living a more Healthy Lifestyle in general. Medical, Health, and Fitness Professionals can proactively support women with disabilities to learn about Nutrition, Healthy Eating, Weight management, and related topics. They can also offer recommendations for engaging in a Healthy Lifestyle. Tell me NCHPAD Readers, what types of information on Healthy Eating and Weight Management interest you? How can Medical Professionals and other Health and Fitness Professionals assist you to engage in a Healthy Lifestyle? Leave comments and tell us your story on the NCHPAD Endless Capabilities blog (http://blog.ncpad.org/). [iii] “Managing weight. (just for women).” Paraplegia News. Paralyzed Veterans of America. 2008. [iv] “Managing weight. (just for women).” Paraplegia News. Paralyzed Veterans of America. 2008. [v] “Managing weight. (just for women).” Paraplegia News. Paralyzed Veterans of America. 2008. [vi] Jackson, A., Morrow, J., Hill, D., & Dishman, R. (2004). Physical activity for health and fitness. Champaign, IL: Human Kinetics. [vii]Hsieh, K. K., Rimmer, J. H., & Heller, T. T. (n.d). Obesity and associated factors in adults with intellectual disability. Journal Of Intellectual Disability Research, 58(9), 851-863. [viii]Hsieh, K. K., Rimmer, J. H., & Heller, T. T. (n.d). Obesity and associated factors in adults with intellectual disability. Journal Of Intellectual Disability Research, 58(9), 851-863. [ix] Smeltzer, Suzanne C.; Vanessa Zimmerman. “Health promotion interests of women with disabilities.” Journal of Neuroscience Nursing. American Association of Neuroscience Nurses. 2005. I like your person touch on the doctor visits. I remember many times when I was just given a temperature and blood pressure check. I guess that was considered a check up. An hour wait for a ten minute visit. is very helpful information. I am very interested! so nice!